Slots of Vegas is an online casino with a less than favourable reputation for withholding payouts for lengthy periods of time, but should this casino be avoided completely? 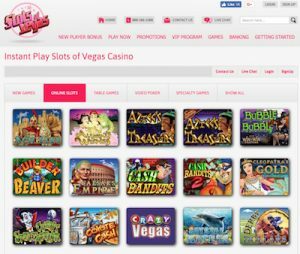 We have done a detailed review of Slots of Vegas, checking out its games, bonus offers, software, customer service and security to see for ourselves. Does Slots of Vegas accept USA players? Slots of Vegas is one of the rare online casino sites that accept players from the United States, although players from Maryland and New York are not accepted. USA players can play for real money using USD, claim welcome bonuses and redeem cash out from the free bonus offers. Players must provide proof of identification before they are able to cash out from the casino, including photo ID and proof of address. If depositing cash via credit card, Slots of Vegas required a credit card authorisation form to be signed. One of the first things you’ll notice about the Slots of Vegas desktop site is it certainly is not the most advanced or attractive casino site out there. While it looks like something that was created in the late 90’s and the game lobby is a little on the clunky side, Slots of Vegas makes up for these downfalls by offering a decent selection of games, good bonus offers and by accepting players from grey-area markets where online casinos are often restricted, like Australia and the United States. Slots of Vegas can be accessed via instant-play directly over your Web browser by signing up for an account and selecting the instant-play option, or the downloadable casino software which is available for PC users only. A browser-based mobile casino site is also available, which we recommend in favour of the desktop site, as the Slots of Vegas casino site looks vastly better when using the mobile platform. 250% Welcome Bonus – New players at Slots of Vegas can claim a 250% matched deposit welcome package, giving you the chance to claim up to $2500 free. To take advantage of this bonus package, you must deposit at least $30. The bonus money can only be used to play slot games and keno, and is subject to a 5X wagering requirement. Use code NEW250 when depositing to claim this offer. 190% Welcome Bonus – If slots and keno aren’t your thing, you have the choice instead of claiming a smaller welcome bonus that can be used on table games. Enter code NEW190 when depositing and you’ll get a 190% matched deposit bonus capped at $1900. A $30 minimum deposit applies, with a 5X wagering requirement on all games except blackjack and video poker which are subject to a 30X wagering requirement. There are also new bonus offers available daily, such as Super Tuesday where registered players can claim a 200% matched deposit bonus on slots and keno or a 190% matched deposit bonus on table games. There’s also a new monthly promo rotating each month, along with a VIP program with its own special set of VIP promos. To check the current promo offers, go to SlotsOfVegas.com and click on the ‘Promotions’ tab for more info. Note: Unless otherwise stated by the casino, all promotional bonuses are strictly non-cashable, which means the bonus money can help you generate winnings but is not able to be withdrawn as cash. When you go to make a withdrawal, all bonus money will be removed from the total amount of your winnings. The bonus offers also aren’t available to players from all countries – check with Slots of Vegas for full terms and conditions to see if you are eligible for the bonus offers. Slots of Vegas offers games from one software provider only, Realtime Gaming (RTG), with all titles available to play for free in practice mode or for real money bets. There are over 130 games on offer which are divided into four different categories with variants available as detailed below. All financial transactions at Slots of Vegas are handled in US dollars. Other currencies are accepted by will be subject to conversion fees as the casino converts your local money to USD. Withdrawals are available using Neteller, Bitcoin, Cashier Check or Wire Transfer only. Withdrawals via check require a minimum of $300, while the smallest amount you can withdraw via bank wire transfer is $200. This casino has a dodgy reputation for taking months to process withdrawals once a request has been put in, so consider this reputation before deciding whether or not to play at Slots of Vegas. The lack of variety when it comes to deposit and withdrawal options is a big downside of Slots of Vegas, as these restrictions are sure to deter some players. While we haven’t had the personal experience of requesting to cash-out any money, the reputation for withholding payouts doesn’t fill us with much confidence. Slots of Vegas does not provide any information on its site about where the casino is licensed, although within the FAQ section it states, “We are completely licensed and work in conformity with all laws pertaining to online gambling.” A quick Google search told us this casino is licensed in Costa Rica, although we cannot confirm this information. In terms of security, the site is protected by 128-Bit SSL (secure socket layer) digital encryption so all personal and financial transactions are safe. Slots of Vegas has casino hosts on standby to assist players 24/7 via live chat, with other options available if you’d rather contact the help team via email or phone. There’s also a good coverage of general queries answered in the FAQ section. Should I play at Slots of Vegas? There are some pros to playing at Slots of Vegas. The bonus offers are solid, players from a wide range of countries (including the USA and Australia) are accepted and there’s a pretty good selection of games available. However, the cons include limiting restrictions on deposit and withdrawal options, lack of information about casino licensing and a reputation for withholding payouts. Given its reputation, we would only recommend Slots of Vegas for players who don’t have many other choices and highly recommend you read all fine print and terms and conditions before making a deposit.